Hopefully the following list will give you some ideas of how you can put the "silent missionaries" to work. 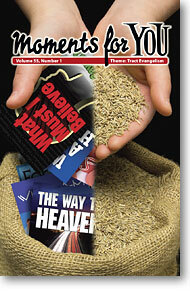 No matter where or how you choose to distribute tracts, seek the guidance of the Holy Spirit for each tract placed, and then pray for the Lord of the harvest to bless the seed sown. 1. Put in greeting cards. 2. Pass out door to door. 3. Share with fellow campers. 4. Tack up on bulletin boards. 5. Put in pockets of used clothing given away. 6. Pass out at parades, festivals, and special events. 7. Hand out at stadium entrances, concerts, etc. 8. Mail out (with your return address) to names in a telephone book. 10. Give to attendants at parking garages, toll booths, etc. 11. Leave in motel rooms (in the drawers, telephone book, etc.). 12. Include in bills paid by mail. 13. Hand to store employees, check-out clerks, valets. 14. Leave in returned library books. 15. Put in magazines in waiting rooms. 16. Get permission to put up tract racks in stores, businesses, etc. 17. Enclose with letters to prisoners, pen-pals, etc. 18. Leave with (generous) tip in restaurants. 19. Give to hospital and nursing home patients while visiting. 20. Hand out at zoos, picnic areas, beaches. 21. Leave on seat in bus, cab, airplane, etc. 22. Leave in locker at health club. 23. Pass out on busy street corners. 24. Give out on college campuses. 25. Leave in break room or cafeteria at work, school. 26. Leave for newspaper boy, mailman, etc. 27. Put in each box or bag of merchandise you sell. 28. Put in airport lounges, bus terminals, etc. 29. Give to students at Vacation Bible School and Sunday School. 30. Rent booths at fairs for tract displays.